This meal? Was awesome. 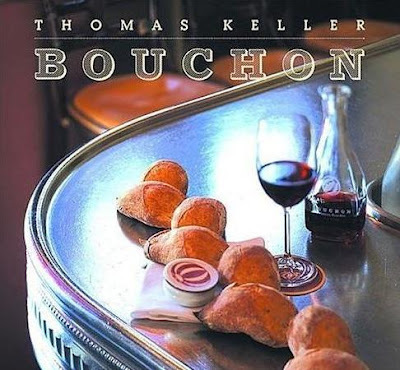 I've had Thomas Keller's Bouchon cookbook since it first came out, but I hadn't cooked out of it yet and I figured a classic dish like Steak Frites was a good place to start. The original plan was to actually follow the recipe, since Keller is one of the few cookbook authors I trust enough to do so, but my tendency to obsess about things (or, more flatteringly, my adventurous spirit) got in the way. You see, I've had sous vide on the brain as of late. I tried a bit of ghetto-style sous vide last year, interestingly enough on another occasion when I was ignoring Thomas Keller's carefully thought-out instructions. (Rather than creating a vat of salmon-flavored olive oil by poaching the salmon in oil at a low temperature, I rubbed the salmon with olive oil, vacuum-sealed it, and cooked in a water bath maintained at that temperature. It was totally effing awesome, and didn't waste a vat of olive oil...) That preparation required me to maintain the temperature for 10-12 minutes, whereas a lot of sous vide recipes require several hours of carefully maintained temperature. My friend T has taken on near-mythical status in my mind for his ability to build or fix just about anything, so I have enlisted his help in building a super-cheap home sous vide machine. (Right now it's looking like it will be at least $100 cheaper than the next cheapest option...) Anyway, all this sous vide talk lately got it into my head that I should sous vide the steak in this recipe rather than pan-searing it... and I'm really glad I did. First up, though, let's get through the other components of this dish. Half of the awesomeness of Steak Frites is that crispy, golden pile of Pommes Frites. Potatoes were cut into 1/4" x 1/4" x 4" batons, then rinsed and soaked in cold water to pull out excess starch. (You can tell it's high-quality by the picture of the cow...) and, after beating it into submission, combined with parsley, lemon, and a pinch of kosher salt. This is another small thing I may change tonight, but it turned out totally awesome, so I don't know... The recipe calls for adding them to the pan at a certain point in your steak-searing, but my steak would already be perfectly cooked and thus would only sear long enough to get color, so I sautéed the shallots and thyme first, then cranked up the heat and added the steak. The result was some serious caramelization... certainly more than Keller would want. My friend Mel and I used to joke about how we don't believe it's possible to have too much caramelization, though, and I thought the shallots tasted phenomenal even if they didn't look particularly delicate ore pretty. Alrighty. Back to that steak. I was supposed to use a flatiron steak, but I wasn't planning this far ahead when I was at the awesome butcher last week, so I used what I had on hand: a gorgeous rib eye (aka Emmo's favorite kind of steak). The steak was in a vacuum bag already, and I left it there (I worried about salt breaking down the meat over the course of 4 hours, and decided to season just as I pan-seared at the end): I spent a few hours testing the temperature stability of my water bath, then added the steak on a pile of bamboo skewers (to keep it off the bottom) and monitored the temperature from the den with my remote digital thermometer. This worked reasonably well, but required me to run in and move the wok's temperature control knob about a millimeter in either direction every so often (I was shooting for 127-128°F, so I ran into the kitchen whenever the temperature drifted down to 126°F or up to 129°F, thus giving me about a 4°F temperature range). This became seriously annoying after a couple hours, which would prevent me from using this technique on a regular basis until I get my new and improved sous vide system set up, even though this method did technically work. Anyway, as I anticipated from blog posts I've seen about sous vide steak, the steak came out of the bag looking pretty sad. A quick sear in a hot cast iron skillet (which happened to include shallots, thyme, and butter in this case) adds a bit of color without any real cooking, leaving you with a more appetizing-looking hunk of meat. then threw the plate under the broiler for a few seconds to get the butter to the point where it was just starting to melt. Finally, it was time to plate up my pommes frites and spicy aioli and sit down to enjoy this spectacular meal. I tend to eat my steak rare, but I went closer to medium-rare on this one because I knew I wouldn't have to over-cook the outer meat to get the inner meat to the perfect temperature. The technique gives you a steak that is perfectly cooked throughout, every bite moist and delicious. It may seem like I'm taking my tendency towards the hyperbolic to a new level with this post, but I was seriously blown away by every single bite I took. The shallots were amazing, the steak was ridiculously tender and delicious, the fries were possibly the best I've ever had, and the aioli was pimp (for lack of a better word that I haven't already used). I was, in short, a very happy camper.